If you've ever dreamed of hitting a pace bowler for six in the final over, or guiding your team to the County Championship title, then Cricket Coach 2007 is for you! Manage every aspect of your club or national side. Your decisions alone will make the difference between success and failure. 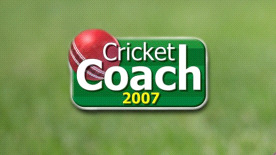 With over 3700 players and 100 teams to choose from, Cricket Coach 2007 has it all. Features all test-playing nations and over 100 county and state teams from around the globe. Play in test matches, one day internationals, 20 over and all first-class and limited-over competitions. Manage all on and off-field activities; recruit new players, plan match tactics, set field positions, assess the weather conditions - do absolutely everything expected of a professional cricket coach!